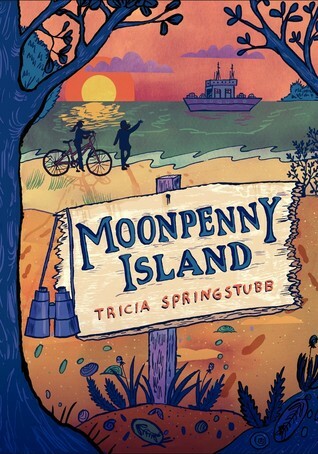 Moonpenny Island is a total gem that I want everyone to read. Author Tricia Springstubb's writing reminds me of Marisa de los Santos--this is one of the highest compliments I can give. The book is full of beautiful descriptions, like, "Flor's afraid of the dark, and out here, she can tell, the dark would be that thick, suffocating kind, the kind that rubs against you like black fur." As the only eleven-year-olds on Moonpenny Island, Flor and Sylvie are lucky to have each other as their best, perfect friend. When Sylvie is sent to school on the mainland, Flor thinks her world will fall apart. Nothing is as it seems, nor will it be again. It's interesting that there is a scientific side to this, as well as one of my favorite books of the past year, The Fourteenth Goldfish. Flor meets a geologist who is on the island to study prehistoric trilobites, the first organisms to develop sight. The ability to see things clearly or with fresh eyes is a recurring theme in the novel, so I love how it factors in. I hope that using science to drive home the meaning in books is a new trend in middle grade fiction. Like Circus Mirandus, I am debating whether this should be on the summer recommended reading list, or if I should read it aloud to the class. Either way, it is going to be enthusiastically shared with my students.